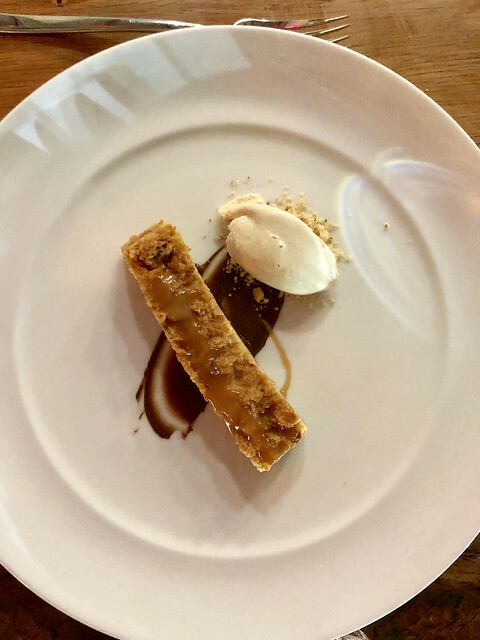 When your birthday falls during Winter Restaurant Week, it’s a sure sign from the D.C. food gods that you ought to treat yourself to a normally pricy prix fixe meal. We hopped in Ubers and headed out to Ivy City for a meal at Gravitas. Gravitas is housed in a former tomato-packing space in the up-and-coming neighborhood. With lots of natural light, greenery, whitewashed brick walls and two levels for dining, the vibe feels distinctly Scandinavian with room to spread out. Chef Matt Baker (formerly of City Perch) designed a frequently-changing menu which we’d describes as mid-Atlantic eclectic. Personally, we found the inspiration for the menu is a little confusing, missing cohesion, though it might have just been because of the Restaurant Week specials. Diners for regular dinner service can choose from a multi-course customizable menu. And were were pleased to see such an emphasis on vegetable-forward dishes. 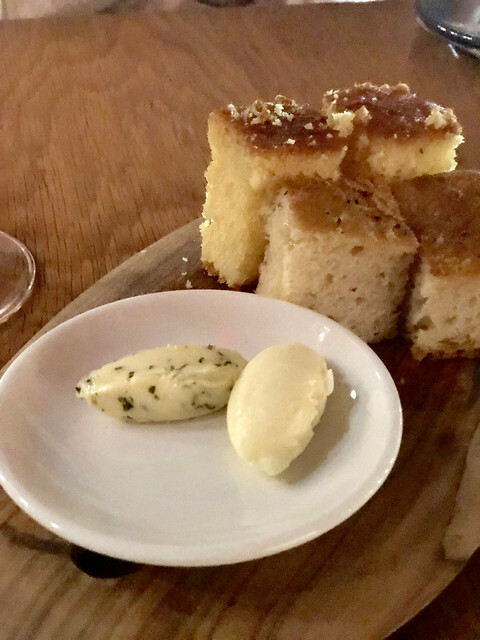 After hearty glasses of Anne-Amie Pinot Noir, we started with homemade focaccia and cornbread with honey butter and a seaweed butter. Both were light, nice starts to what ended up being a mixed-bag of a meal. Feeling adventurous, we tried to choose the most inventive dishes that were available. 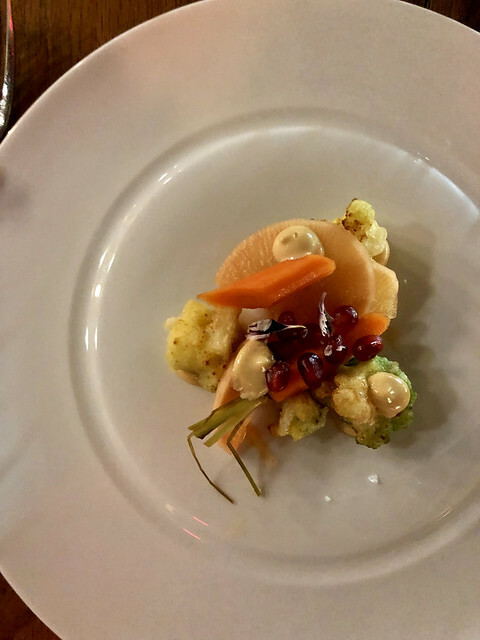 As such, our first courses were fried romanesco with pickled veggies and pomegranate seeds, and a coconut-curry rice cake topped with Brussels sprouts. The fried romanesco had some interesting textures to it, but the pickled veggies added so much acid that they overpowered every other bite. The coconut-curry with Brussels sprouts was a brilliant flavor combination that we haven’t tasted before — we only wish that the rice cake wasn’t so bland. We were informed that the truffle gnocchi was one of the most popular items on the menu during Restaurant Week and it was easy to see why. Light, fluffy gnocchi balanced with rich truffle and warm cheese. We just wish that the portion was a bit bigger. 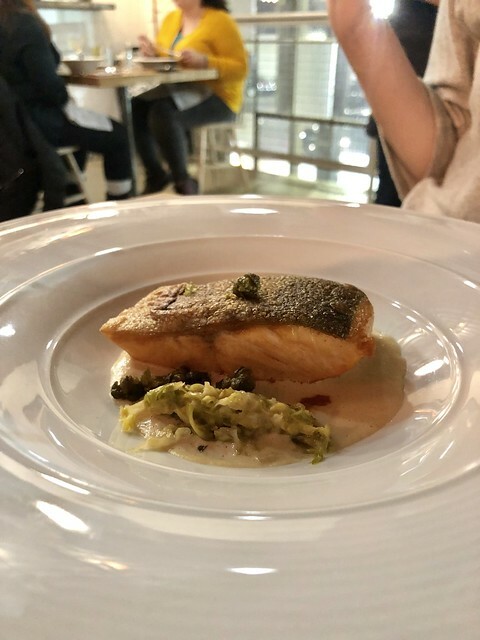 The arctic char was beautifully plated and well-cooked. The portion here was more appropriate for a second course, but not enough for an actual entree. For dessert we opted for the bread pudding with cinnamon ice cream and rich chocolate. It is presented as a stick, but we thought it might be better served in a ramekin as a proper pudding, since the flaky outside didn’t add much to the dish. But the flavors were spot on and we ate it all anyway. 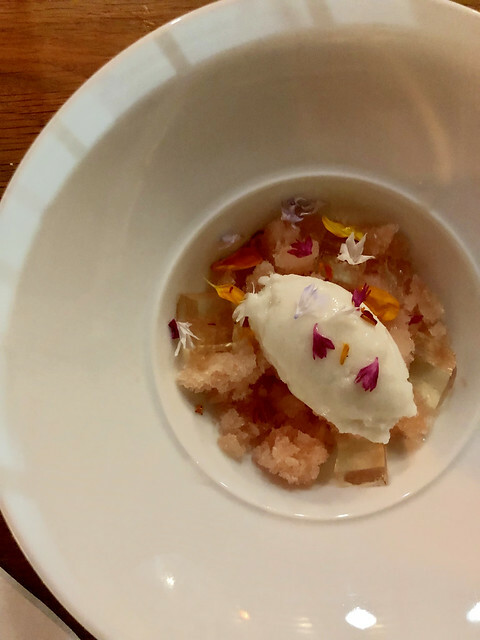 Far better was the grapefruit granita, served with lychee sorbet, and rose gelatin. We agreed that if you ditched the Jello (it’s tough to eat when everything else just melts in your mouth,) you’d have a perfect dessert. It was inventive, unusual and the perfect palate cleanser at the end of the meal. Overall, the portions were appropriate for a five-course meal, but not the three-courser we had during Restaurant Week. Gravitas just needs a few small tweaks, but Chef Matt Baker is definitely onto something special. The menu is frequently changing, so keep an eye on this one. We’ll be sure to come back when they launch brunch!